Monoclonal antibodies have long been powerful tools for basic research as well as for the diagnosis and treatment of disease. 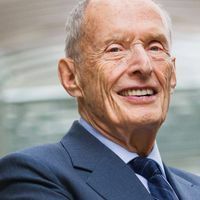 Traditionally, researchers obtained such antibodies from rodents using the technique pioneered by Nobel Prize-winners Georges Köhler and César Milstein in the mid-1970s (Nature, 256:495-97, 1975). In this approach, researchers first collect antibody-producing cells from mice exposed to an antigen of interest and fuse them to myeloma cells, forming so-called hybridomas that can survive for a long time in culture. By screening single hybrid cells for those that produce the antibody of interest, researchers can develop a cell line generating virtually unlimited amounts of highly specific antibodies. Antibodies derived from animals, however, are problematic for use as therapeutics, because the molecules can trigger immune responses in humans. To circumvent this problem, researchers have developed several different methods for obtaining antibodies that are naturally produced by human immune cells in response to specific pathogens or antigens. One strategy involves isolating human memory B cells that have been purified from a sample of blood and immortalizing them by infecting them with Epstein-Barr virus, then screening in vitro cultures for those that generate antibodies with the desired specificity. 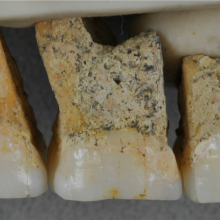 “This has been highly valuable for many years, and different labs have done things to make this a more efficient process,” says Patrick Wilson, an associate professor of immunology at the University of Chicago. “But it’s laborious in the lab, because you have to make all these cell lines, and you have to screen many cells.” Furthermore, not all cells survive the immortalization process, limiting the number of natural antibodies that can be isolated utilizing such an approach. This technique is best for “when you have an enriched population of antigen-specific cells—they’re not there, except for a short time after vaccination or infection,” says Wilson. It would be extremely laborious to use this strategy to try to identify an antibody against an antigen of interest using the blood of a person without an active immune response, he says, because millions of memory B cells are present in the blood, each of which is uniquely specific for a different antigen. 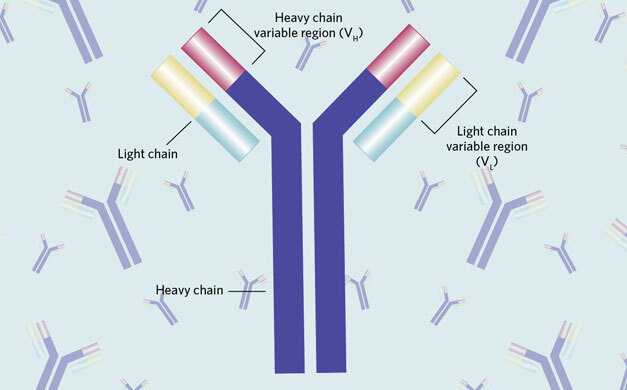 Although all of these approaches have been valuable for identifying new antibodies and characterizing human immune responses, they are time-consuming and complicated. Here, The Scientist spoke with a few experts who are working on new ways to speed the discovery and isolation of monoclonal antibodies. 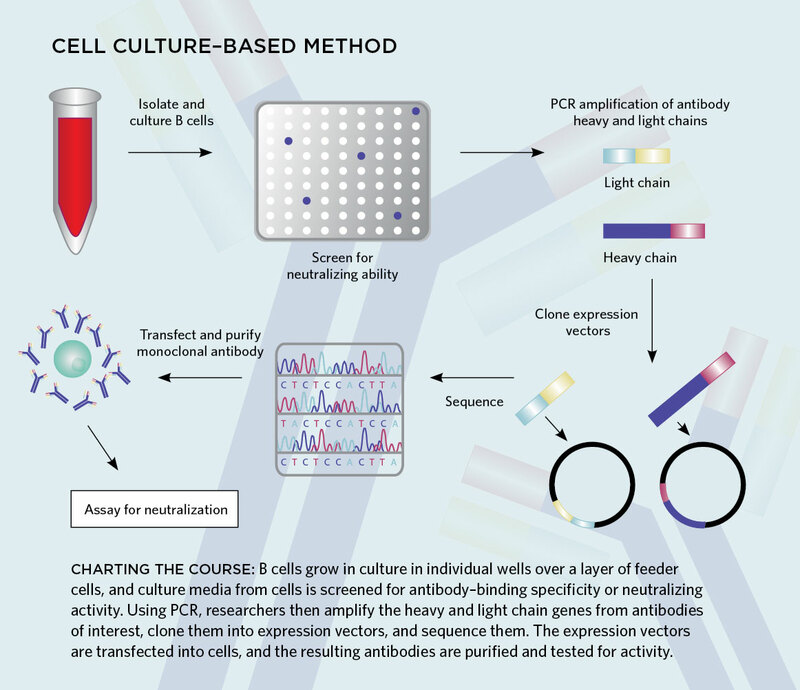 CHARTING THE COURSE: B cells grow in culture in individual wells over a layer of feeder cells, and culture media from cells is screened for antibody–binding specificity or neutralizing activity. 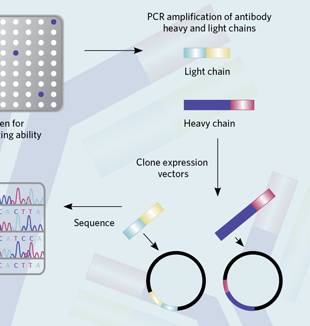 Using PCR, researchers then amplify the heavy and light chain genes from antibodies of interest, clone them into expression vectors, and sequence them. The expression vectors are transfected into cells, and the resulting antibodies are purified and tested for activity. Problem: The immortalization of antibody-producing cells from patients infected with HIV can be inefficient, and even when cells are successfully immortalized, some clones tend to be unstable. While previous researchers have obtained HIV-neutralizing antibodies using fluorescent probes to pull out antigen-specific memory B cells from a sample of blood, Connors and his team wanted to discover new HIV-neutralizing antibodies, without being limited only to those that are specific for known antigens. Solution: Connors and his team first used flow cytometry to isolate B cells from an HIV-infected donor. But rather than cloning the antibody heavy- and light-chain genes from each cell, as in a typical expression cloning set-up, Connors’s group distributed the isolated cells in 384-well plates, where they cultured them in the presence of feeder cells and signaling molecules that help to keep the B cells alive and also stimulate them to secrete antibodies. After about two weeks, the researchers screened the supernatant from each well for its ability to neutralize HIV in vitro. Then they cloned the antibody genes from the cells that produced supernatants with neutralizing activity and, finally, produced recombinant versions of the antibodies (Nat Protoc, 8:1907-15, 2013). Using this method, Connors and his team isolated two new antibodies that potently neutralize many different strains of HIV (Nature, 491:406-12, 2012). Applicable to lots of different diseases. “As long as you have a target function that can be used for screening, it allows you to pull out antibodies,” says Connors. The entire protocol takes about three weeks to complete, says Connors. The feeder cells are freely available through the AIDS reagent program. The reagents required for neutralization assays can be expensive. Although this strategy can theoretically be done by hand, the large number of wells that need to be screened—in Connors’ case, as many as 60,000–140,000 —makes this technique more amenable to labs with robotic liquid handling devices. Some antibody-producing cells may not survive the culture process. Cost: Connors estimates that his technique costs roughly $400–$500 per 384-well plate. Depending on the yield of B cells from a blood sample, researchers will likely use about 20 plates for a manual set-up, and 60–80 plates for a robotic set-up. 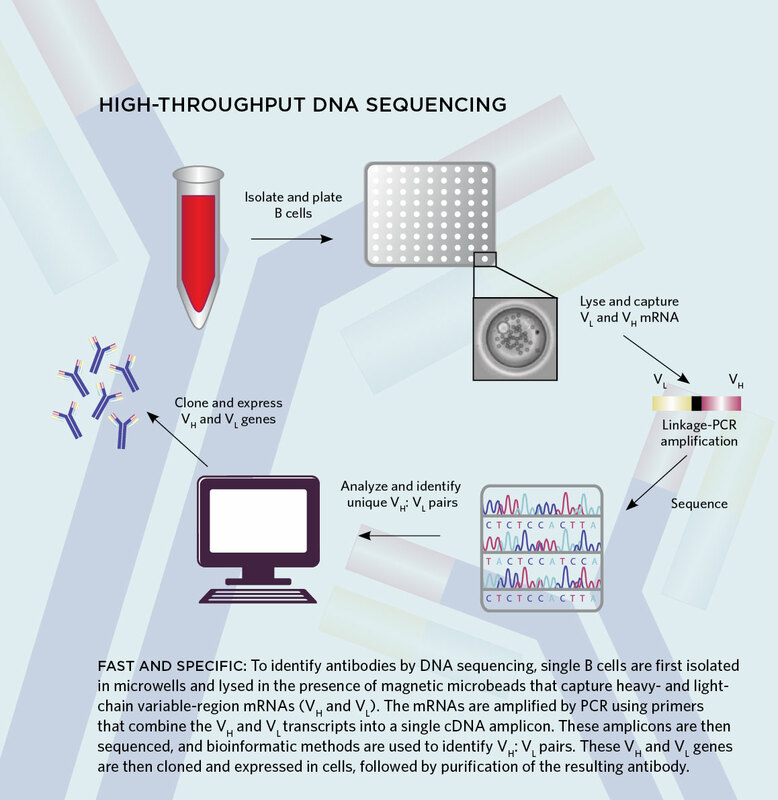 FAST AND SPECIFIC: To identify antibodies by DNA sequencing, single B cells are first isolated in microwells and lysed in the presence of magnetic microbeads that capture heavy- and light-chain variable-region mRNAs (VH and VL). The mRNAs are amplified by PCR using primers that combine the VH and VL transcripts into a single cDNA amplicon. These amplicons are then sequenced, and bioinformatic methods are used to identify VH: VL pairs. These VH and VL genes are then cloned and expressed in cells, followed by purification of the resulting antibody. Problem: In a paper published in 2010, Georgiou’s group showed that it could use high-throughput sequencing of immunoglobulin genes to rapidly produce antigen-specific antibodies (Nat Biotechnol, 28:965-69, 2010). The team simply generated recombinant antibodies using the heavy- and light-chain genes that were most abundantly expressed in the antibody-producing cells of mice following immunization. However, the technique could not distinguish which pairs of the heavy- and light-chain genes were originally expressed by each of the animal’s antibody-producing cells. Therefore, to reconstruct a native antibody, Georgiou needed a strategy to sequence the heavy and light chains together. Solution: Georgiou’s team first used flow cytometry to purify B cells from blood. 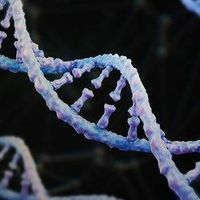 The researchers then isolated single cells in 125-picoliter wells on a slide, and amplified portions of the variable regions from both the heavy- and light-chain genes of each cell, using specialized PCR primers that incorporated both gene fragments into a single piece of DNA. Then they used next-generation sequencing to decipher the sequences of the linked strands and bioinformatics processing to analyze the paired heavy and light chains. Using this approach, they identified 86 unique pairs of heavy and light chains from the antibody-producing cells of a human donor who had been immunized with tetanus toxoid (Nat Biotechnol, 31:166-69, 2013). When they produced 10 different recombinant antibodies using the sequences from 10 of the pairs, they found that all of their antibodies bound tetanus toxoid in vitro with high affinity. By contrast, previous studies have shown that only about 10 percent of the antibodies generated using techniques that rely on the random pairing of heavy- and light-chain genes are antigen-specific, says Brandon DeKosky, a graduate student in the Georgiou lab who helped to develop the technique. Very fast. “You can go from cells to fully native human heavy- and light-chain sequences within a week,” DeKosky says. The microwell slides are not commercially available, so users will need to make their own. Cost: DeKosky says that his team spent about $550 on the reagents needed to obtain the sequences of more than 2,700 unique pairs of antibody genes from a sample of B cells. COMPREHENSIVE INTERROGATION: To identify antibodies by proteomic mining, antigen-specific antibodies are first purified from serum. 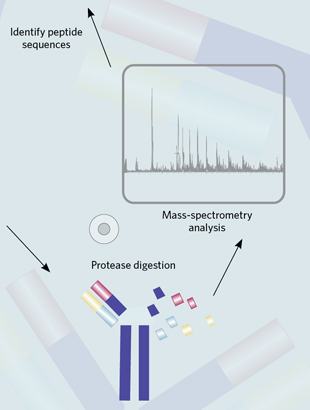 Proteases digest the antibodies into peptides that are analyzed by mass spectrometry. To identify these peptides, a reference database is generated by sequencing the VH and VL genes from B cells isolated from the same blood sample. 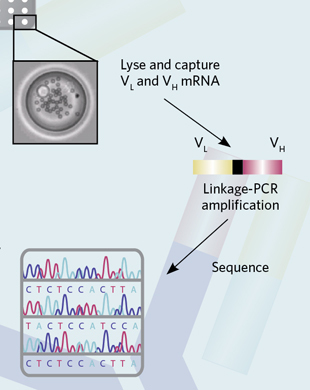 Combinations of VH and VL sequences are then cloned and expressed in cells to generate antibodies that are then screened for their binding specificity and activity. Problem: The antibodies generated by cell-based strategies—whether through immortalization of B cells, expression cloning, or sequencing—are not representative of the full repertoire of antibodies that are actually circulating in the serum in vivo. That’s because some cells may die during the isolation process, and the antibodies encoded by others may not actually be secreted into the circulation. 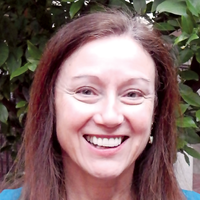 “The reason we make antibodies is to fight off infections,” says Polakiewicz, and thus, “what matters is what circulates, because those are the antibodies that end up finding the pathogens and recalling other immune cells to get rid of them.” Therefore, Polakiewicz and colleagues wanted to develop a strategy to directly analyze the antibodies that are circulating in the blood. 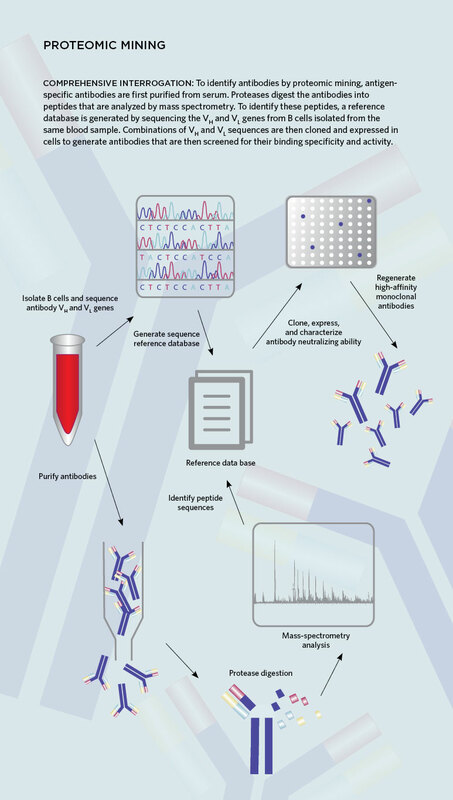 By comparing the immunoglobulin gene sequences with the peptide mass spectra, Polakiewicz’s team was able to identify and clone the heavy- and light-chain genes that encoded the antibodies present in the serum sample and generate several recombinant antibodies that bound with high affinity to the hepatitis B virus antigen (Nat Biotechnol, 30:1039-43, 2012). The software the team used in their bioinformatics analysis of the peptide and gene sequences was developed in-house, so users will need to create their own. This approach disrupts the native pairing of the heavy and light chains present in antibodies in the serum. Labor intensive. Takes about 21 days to generate functional recombinant monoclonal antibodies. Cost: Polakiewicz was unable to estimate the cost of identifying antibodies using a proteomics-based approach, but he says it probably costs about the same or slightly less than one of the commonly used cell-based strategies.